Could we get more Earthquakes due to global warming and thermal expansion of the Earth's crust? 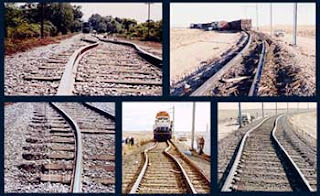 Thermal expansion can release quite some force as is seen in bridges and railroad tracks that are deformed due to hot weather. I am wondering whether thermal expansion of the Earth's crust due to global warming can similarly lead to seismic activity, especially at subduction zones where one crustal plate slides under another one. I have searched the scientific literature, but was unable to find any articles on the topic, while it sounds quite straight forward to me. Did really no one have this idea before, or was it already debunked in 1960? Dear journalists, This is not a press release; I do not like science by press release. While I am a scientist, I have no special expertise in geology. Please only write about this if the standards of your publisher are so low that you would also write about it if you next-door neighbour would have this idea. In other words, please wait until there is a scientific publication on this. Even better would be to wait until there are several papers, but I realise that that is illusory. Dear "skeptics", I did not write that your SUV is responsible for the seismic atomic genocide of the the Japanese population. This post is only written to bring the idea under the attention of the right scientists. At this stage, it is very likely that the idea is wrong and that nothing will happen. Dear colleagues, the reason to write this post is to attend someone with the skills to investigate it. It is thus highly appreciated if you could forward it to someone who may have the right skills. I guess two skills are needed: 1) modelling of the warming of the crust and 2) dynamical modelling of the crust expansion. If you have one of these skills, please contact me, maybe someone with the second skill also responded. If you have both skills or know someone, feel free to act as if it is your own idea. Ideas are cheap and this back-of-the-envelope computation was quickly made. The real innovative step is deciding which idea is worth spending a year of your time on to make it into science. It would be nice if after publication you could act as if a colleague attended you to this post and send me a copy of the article. I am curious. The length of the Equator is roughly 40x106 metres. And my high-school tables book gives thermal expansion coefficients for various stone types between 4 and 12x10-6 K-1. So for a one degree temperature change one would expect that the Earth's crust would expand by 160 to 480 metre. (More accurately, one would use the size of a plate not the circumference of the Earth. On the other hand, the projected temperature change is larger than one degree.) For the sake of the argument, let's say that it is about 100m. One thing I do not know is whether the crust is sufficiently brittle/solid (like a railway track or bridge that deforms by heat) or whether there are air and liquid pockets and cracks which could absorb the expansion. Furthermore, maybe the additional pressure would mainly increase the width of the crust not its length or the crust would just crumple a little more. One way to study the influence of changes in measurement techniques is by making simultaneous measurements with historical and current instruments, procedures or screens. This picture shows three meteorological shelters next to each other in Murcia (Spain). The rightmost shelter is a replica of the Montsouri screen, in use in Spain and many European countries in the late 19th century and early 20th century. In the middle, Stevenson screen equipped with automatic sensors. Leftmost, Stevenson screen equipped with conventional meteorological instruments. Picture: Project SCREEN, Center for Climate Change, Universitat Rovira i Virgili, Spain. We intend to build a database with parallel measurements to study non-climatic changes in the climate record. This is especially important for studies on weather extremes where the distribution of the daily data employed must not be affected by non-climatic changes. There are many parallel measurements from numerous previous studies analysing the influence of different measurement set-ups on average quantities, especially average annual and monthly temperature. Increasingly, changes in the distribution of daily and sub-daily values are also being investigated (Auchmann and Bönnimann, 2012; Brandsma and Van der Meulen, 2008; Böhm et al., 2010; Brunet et al., 2010; Perry et al., 2006; Trewin, 2012; Van der Meulen and Brandsma, 2008). However, the number of such studies is still limited, while the number of questions that can and need to be answered are much larger for daily data. Unfortunately, the current common practice is not to share parallel measurements and the analyses have thus been limited to smaller national or regional datasets, in most cases simply to a single station with multiple measurement set-ups. Consequently there is a pressing need for a large global database of parallel measurements on a daily or sub-daily scale. Also datasets from pairs of nearby stations, while officially not parallel measurements, are interesting to study the influence of relocations. Especially, typical types of relocations, such as the relocation of weather stations from urban areas to airports, could be studied this way. In addition, the influence of urbanization can be studied on pairs of nearby stations. Maybe I could even have title this post: the social dimension of life. Many people seem to interpret "survival of the fittest" as relating to the fitness studio. While the fittest are simply those who survived. Whether you survive depends on lot on your tribe and only partially on your self, if you do not behave too stupidly. Frank Forencich speaking at the Ancestral Health Symposium, 2012, explains this social part of health and a full life. Frank Forencich is blogging at The Exuberant Animal and is a refreshing sound in the paleo world. His posts are thought provoking and well worth reading. The transition to automatic weather stations. We’d better study it now.